Yesterday I set the cab back on the frame with new mount rubbers to check cab/engine clearances. The main area of interference was the exhaust manifold and rear of the head. That area fits perfect now after I "massaged" it with a body hammer and block. The cab seam lip behind the engine still needs a couple of spots trimmed back but it's almost there. I have the rear lifting hook, and valve cover removal to consider. I also need to fit the RF fender and locate the spin on fuel filter assembly. The line coming in to the lift pump from the fuel tank has a in line filter, but after it gets lifted, it needs to be filtered again before entering the injection pump. I have to put it where I can get at it. Heater, battery box both block access to the lower firewall, so I'm thinking behind the fender mount air cleaner and ahead of the battery , on the fender. You have to assemble it to find out. Test fit, over and over. Once painted, I'm going to buy a air spray undercoat kit and get the quality canned undercoat that sprays on and drys clean to the touch. Rock stars/dents in the fenders and driving it in the winter make me think this application would be worth while. I might use the same sprayer to bed line the box. If you do it yourself, the savings will pay for the kit . If you seriously use it for basic transportation, the next thing you find is no room in the cab for coats, and road kit. 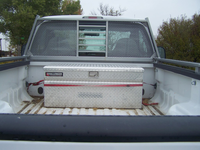 A storage container that locks located at the front of the pickup box is another thing to consider. It needs to be quick connect in case you want to haul something long in the bed. Waterproof and light. Any suggestions? I believe the plastic trail box I use in the 2A would work good, I'll send you a photo!. That's if plastic is ok, perhaps your a purist and want period correct "Bakelite, or good old American steel. Fab one out of an old stock tank, or some other cool period correct item! Oilly your orig thread still lives in "the archive" section.. Muley..
My 20 lb. maul will remedy that clearance issue! I use a (free from my father in law) alum diamond plate truck box as my F250 is single cab. Wt- maybe 20lbs empty, lockable, ratchet strapped in for easy removal.. There's only one problem with the strap tie down, and that's the low downs that want everything for nothing! I can bring it back if you want Oilly. I archived it so it would be safe for the future. I like how Oilleaker considers facts like removing a valve cover as required for clearance purposes. An example of a good "bubba" mod on my rig is the hole in the driver's side fender so you can put a screwdriver on the steering box tension screw. Today I test fit, mounted and bent 5/16 fuel lines for the spin on fuel filter. That includes mounting up the RF fender, battery box, and air cleaner assembly. The heater core 5/8 tubes also come through in this area. The round knurled knob is the manual over ride for the lift pump. You'll see a in line fuel filter installed and full of fuel where the fuel tank supply line exits the frame and enters the lift pump. Then out of the lift pump and curling upwards is the clear supply line to the injector pump. That clear line will be removed and the fuel routed over and back through the spin on filter. The spin on is totally accessible for changing. I'll rubber hose to the metal lines a short distance to allow for vibration. You want nice clean fuel for the injection pump. Bend and spend if you don't! It doesn't have a water sensor built in like my Dodge diesel does. The tank and lines are all new, so if it gets any garbage in it, it will be from the gas station. Now it's back off with the cab, clearance or grind the lip for valve cover removal and the rear lifting hook. Studewillys keen eye knew that was coming! And then-------------the pain begins. Blasting, welding, bodywork, and finally paint. Yuk. Window glass, window rubbers and seal, door seals, interior trim, wiring, fitting the body back together, on and on. This will be the last complete I do. I plan on moving all stuff home next spring and putting my wonderful shop up for sale. Time to trim expenses in retirement, like taxes and overhead. I'll miss it, but once I have my "kit" all organised at home, I'll soon forget it. I dunno OilLeaker. The first time you do work at the house shop and cover the fleet with dust/paint/rust/metal...That's the day you'll miss the off-site shop! The lines on the filter , it's not a natural routing on a diesel, in most cases the filter is mounted above the lines so the air settles out there and can be bled off easily!, just say'in. It actually is a bit uphill to the filter. I'll prefill the spin on, and then hand pump from the list pump through until I see no more air going to the injector pump. There is a bypass wheel valve at the injector pump you open to bleed it. then you close it and fire up. It works well. My Dodge remote fuel filter bleeds out the top of the canister assembly while the Kubota bleeds at the top of the injector pump. I'll use more of that clear webbed fuel line when I actually hook it up so I can see what's going on.